Tunis was not a place I had originally planned to visit. I was on a cruise which took a detour, resulting in a change of port spur of the moment. It was announced that we were heading to North Africa! I was quite surprised as we were supposed to sail to Portofino, Italy. The thought of going to a new continent was pretty exciting. As we sailed into Tunis, it was very hot, dry, and dusty with flies all around. I heard pipes playing and looked towards the harbor and saw guards, camels, taxi cabs and herds of people. It seems chaotic and noisy. I was a bit apprehensive about getting off, as I really didn’t know much about Tunis. As we walked off of the ship, we were surrounded by vendors. Thankfully, the cruise ship educated us in advance about the vendors. In Tunis if a vendor put a necklace, a scarf or essential oils on you- you’ve just purchase it! I tried my best not to make eye contact, so the vendors didn’t think I was interested. The vendors followed us all the way until we were up the stairs on our bus. Tunis is a place where you need to bring bottled water. 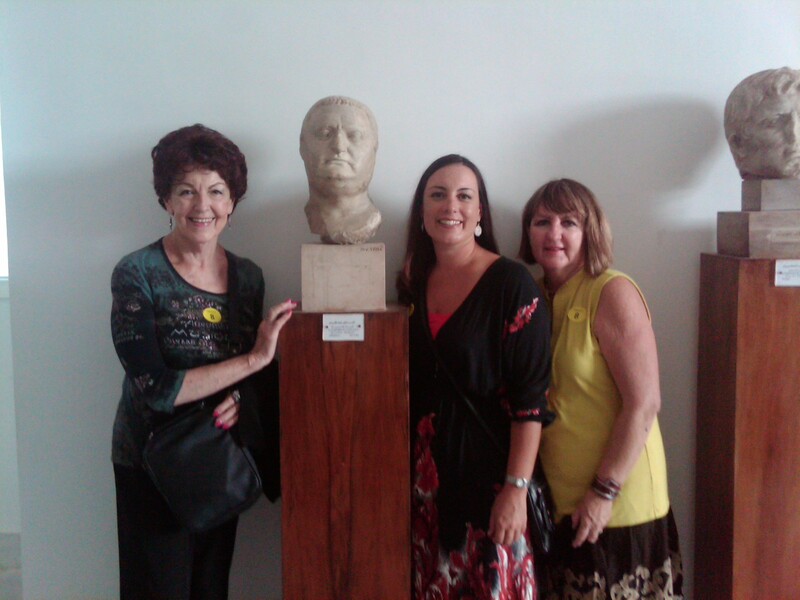 The best part about the day in Tunisia was touring the National Bardo Museum. 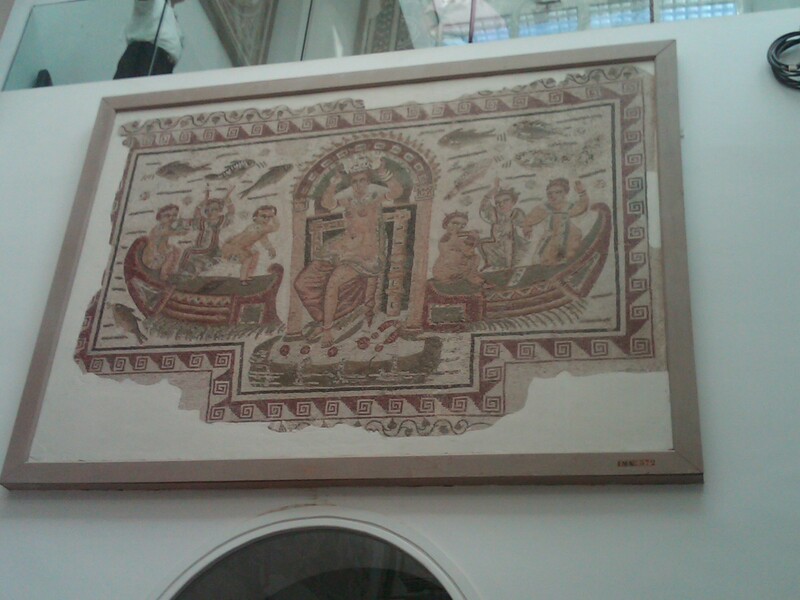 The museum houses some of the oldest Roman mosaics in the world!! 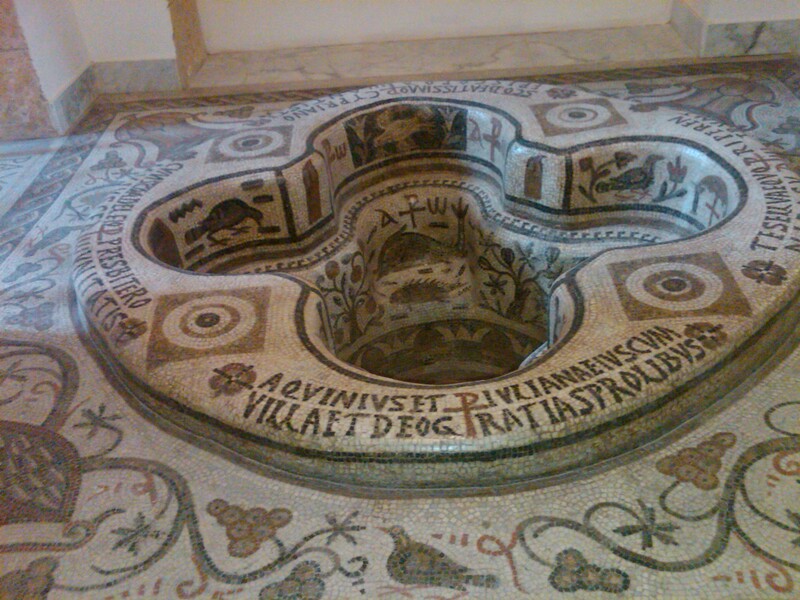 It was absolutely fascinating and I wished my kids could have seen the mosaics. The museum seemed very modern, open and bright. I was quite impressed with how nice the inside was after driving through the town it is located in. 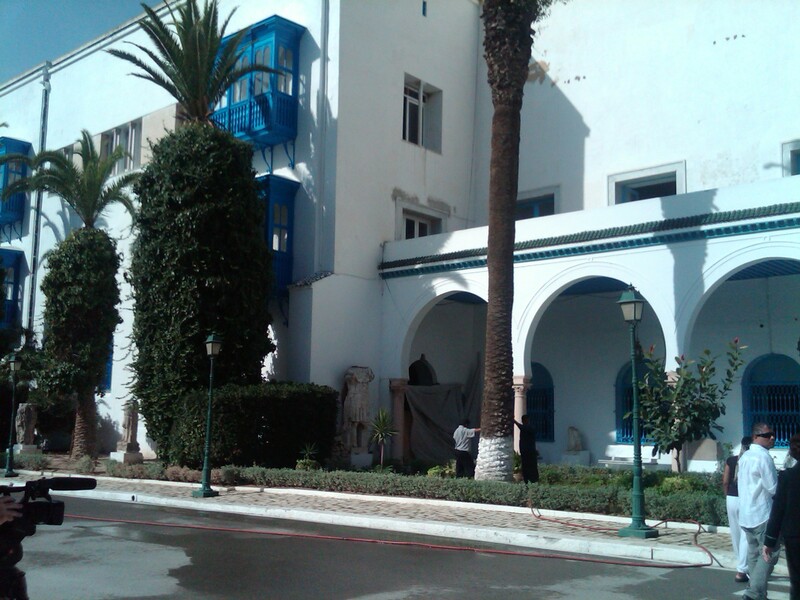 The National Bardo Museum is a jewel of Tunisian heritage. It is housed in an old Beylic palace dating back to the XIXth Century. It retraces, through its collections, a big part of Tunisia’s history (from Prehistory to the contemporary epoch) and contains the largest collection of mosaics in the world including the famous mosaic representing Virgil, the poet. The visitor may discover there an abundant collection of Punic jewels as well as a gallery of Roman sarcophaguses and Christian baptisteries. One of the high points of the visit is a Roman ship’s cargo wrecked off the coast of Cape Africa, facing the town of Mahdia, with its Hellenistic Greek art master pieces: bronze pieces, marble sculptures, and furniture. This was the result of underwater excavations undertaken during the first part of the XXth Century with the participation of Commander Cousteau. The great Tunisian sites classified by the UNESCO as part of the world virtual pantheon of the humanity are: The city of Carthage, Ancient Dougga of western Tunisia, El Djem’s spectacular Coliseum, The refined Arab Medinas of Kairouan, Tunis, and Sousse.Each one of these remarkable cities is present in the Bardo Museum’s collections The museum also includes touching testimonies of the creativity of each of the Tunisian regions since 40,000 years; namely the enigmatic Hermaion of El Guettar (south of Gafsa) which is the first temple edified by man to honor the sky’s supreme force. The best way to describe my day in Tunis, is that I am grateful for the experience, the mosaics and mosques that I had the pleasure of seeing but I would probably not return. If I were to return some day in the future, I would not wear any make-up! Make-up will definitely cause you to stand out in, what I felt to be, an unfavorable way. Since I was only in Tunis for the day, I did not eat any of the food. Independence Day, 20 March – a time when hotel rooms are completely booked. Plan accordingly. Tunisia has a rich cultural history, ever since Antiquity. The Carthaginian Empire, Rome’s arch enemy, was centered in Tunisia. Its capital, Carthage, is now a suburb of Tunis. Founded by Phoenician settlers from Tyre and Sidon (modern day Lebanon), Carthage was an ancient Mediterranean powerhouse. Three wars between Rome and Carthage (known as the Punic wars) were waged in the first few centuries before the birth of Christ. These culminated with the decimation of Carthage in 146 B.C. by the Roman general Scipio, who is said to have wept at its destruction. Between the destruction of Ancient Carthage and the Arabic conquests of the 7th century, many cultures have made Tunisia their home. Carthage enjoyed a new period of prosperity under the Roman Empire until its collapse in the 5th century. Roman rule was replaced briefly by the Vandals, who made Carthage the capital of their kingdom. Carthage was then absorbed temporarily by the Byzantine Empire, until the rise of Islam in the 7th century. After the dissipation of the Arabic Caliphates, the Ottoman Empire’s Turkish Pashas ruled Tunisia. With the fall of the Ottoman Empire, Tunisia eventually fell under the sway of European Imperialism, as a French Protectorate, along with neighboring Algeria. 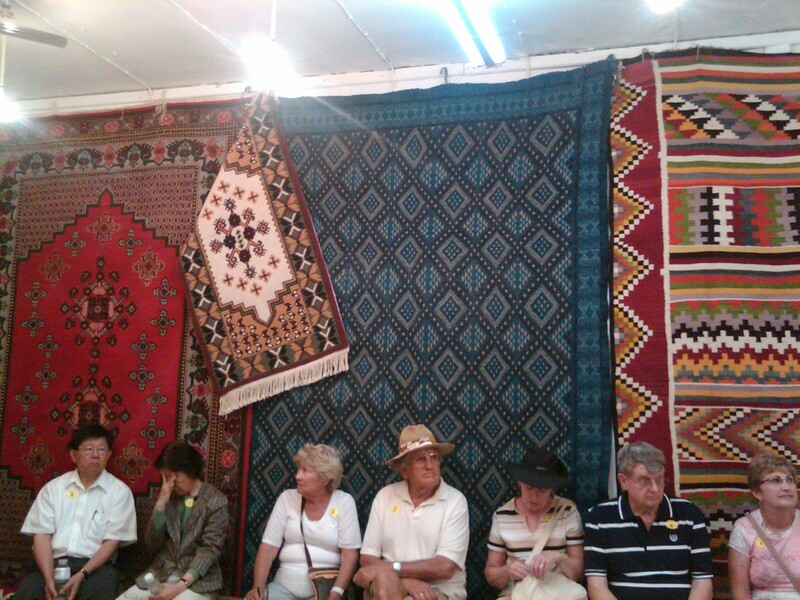 On our tour, the guide took us to a carpet presentation which was a complete surprise to all of us. The carpet presentation wasn’t mentioned as part of the tour and at times was slightly uncomfortable. We were taken to a store, lead up several flights of stairs into a room which was not ventilated. Due to the language barrier, many of us had difficulty understanding what the presentation was about. The tour guide left the room while two salesmen started waving carpets around. The carpets were gorgeous, detailed, original and probably thousands of dollars. The presentation was high pressure sales. I would not recommend this part of the tour as everyone seemed very uncomfortable, not only with the presentation, but with the room we were in as well. It was definitely an experience not to be forgotten! $$ saving tips: In Tunis it can be difficult when it comes to purchasing items. Due to the language barrier, much of the sales are initiated via eye contact. I witnessed a miscommunication regarding a sale which turned frightening. Don’t allow vendors to put anything on you, don’t make eye contact and keep walking if you are not interested in purchasing. It is best to be with a tour guide who can speak the language if you want to shop. There was beautiful jewelry, carpets, silks, and scarves. Purchasing a tour in advance is the best way to tour the city if you are only there for a day. I would not recommend taking a taxi anywhere as some of the tourist were complaining about cab drivers price gouging and misunderstandings about the price quoted once they arrived at the destination.